Mungret College in Co Limerick had been operating as a secondary school since 1882. It was founded by the Jesuits on the site of an ancient seat of learning, namely Mungret Abbey. Mungret College was established as a direct result of the efforts of one of the most able and accomplished Irish politicians of the 19th century, William Monsell. He was an active political figure between the years 1837 and 1893. He held a number of ministerial positions in London, including the role of Postmaster General in Gladstone’s government, was elevated to the peerage and held a House of Lords seat until his death in 1894. The title he took on his elevation was Lord Emly of Tervoe. Tervoe is a townland adjoining Mungret. He became the leader of the group, one of the politicians known as the “Catholic Whigs” and was perhaps the most famous “Catholic Unionist” of the period. In 1861, 40% of Irish landlords were Catholics of whom the great majority favoured the union with Britain. Protestant Nationalism has got a much greater airing by modern Irish historians than has Catholic Unionism. Lord Emly was a kind and benevolent landlord. He looked after his tenants during the Famine and instigated many famine relief activities in the Limerick area. He always held an interest in education and became a close friend of Cardinal Newman. Among his many good works were the founding of two of Ireland’s most famous secondary schools, namely Mungret College (Catholic) and St. Columba’s in Rathfarnham (Protestant). Mungret College closed in 1974 and St. Columba’s is still flourishing. Mungret was one of the six Jesuit Colleges in Ireland. Belvedere and Gonzaga in Dublin, Clongowe’s Wood in Kildare, Crescent College also in Limerick and St. Ignatius’ College in Galway. Clongowe’s and Mungret were predominantly boarding schools, the rest were day schools. Over the 85 years that the Jesuits ran Mungret, it attracted students from all over Ireland, but particularly from Munster counties. There was also a tradition over the years of boarders from County Mayo. Mungret past pupils populated the professions and rose to elevated positions in all fields of human endeavour over the years. In the late 1960s and early 70s the Jesuits were reassessing their role, and it became clear that for a number of reasons Mungret would sadly have to close. One of the reasons was the fall in the number of vocations. The demands of running boarding school were very heavy on the Jesuit Community and with declining vocations the shortage of personnel became acute. As the quality of readily accessible secondary schools improved in the country, the need for boarding schools declined. Many of the younger Jesuits in the post Vatican Council environment of the time wished to pursue their vocations in areas other than the traditional field of education. Mungret College was among the first of the great boarding schools to close during the 70s and 80s. There still remains a tremendous heritage and the Past Pupils’ Union have continued to exist since the closure. The buildings and grounds of the College remain largely the same as when the College closed in 1974 and are being put to good use by a number of organisations. A special reunion dinner will once again be held in the College on the 6th of September 2014. This will be preceded by a special mass of thanksgiving for all the past pupils of the College , deceased members of the past pupils Union, former teachers, members of the Jesuit Community and for all the benefactors of the College including Lord Emly, who donated the money ( ​£2000) to build the beautiful gothic style chapel in 1884. 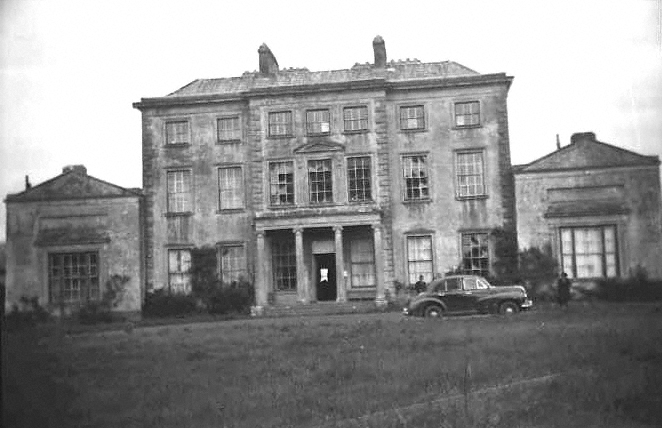 Lord Emly’s mansion (demolished in the 1950’s) at Tervoe showing the Ionic Portico now in Mungret. Ironically that was not all that he or his family donated to the College. As his magnificent Palladian style mansion at Tervoe was being demolished in 1953, the front portico of Ionic pillars was removed and erected to form a new entrance at Mungret College , where it stands to this day. By Matthew Potter, published by Treaty Press in Limerick. Post Script: Mungret was the site of the first Seismograph in Ireland. When the Japanese earthquake of 17 April 1889 ushered in the present era of seismology, the religious order of the Society of Jesus became interested in the subject and set up observatories in various parts of the world. In Ireland, two were constructed at their colleges at Mungret, Limerick (in 1907), and Rathfarnham, Dublin (in 1916). Revd William .J. O’Leary, SJ, who was in charge of the observatories from 1905 to 1929, seems to have been involved in the design of the seismographs.